Main and Me is the free-to-use website that let’s you put your town online in a day, so you can begin to shift a significant portion of online shopping back to local independent business. It’s a year-round marketplace that excludes national chains while allowing online shoppers to discover what’s for sale in the brick and mortar businesses around them. 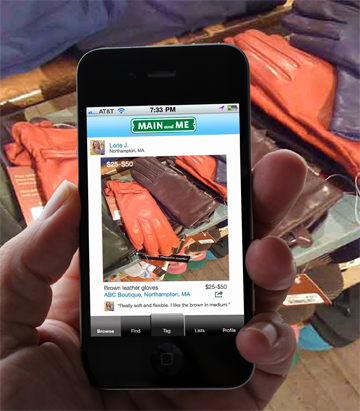 Main and Me is as easy to use as uploading a photo to Facebook; it’s free to upload as many goods and services as you wish, and; it’s pro-active in that a single person or “photo mob” can start putting your town or organization online today–no permission or member consensus required–just in time for the holidays. 3) Personal Pages: galleries shoppers create for themselves as they like, comment on, follow and add goods and services to the wish lists and registries they share with friends and family–whether for holidays, weddings, and other gift-giving occasions, or for the fun of curating the best in local. Tupelo, MS just completed a contest that awarded $500 in downtown Tupelo dollars to the person who uploaded the most photos to the Downtown Tupelo community page. The winner uploaded 689 photos of local goods and services to their Downtown Tupelo shopping page! Main and Me. Start shifting shopping today. (New iPhone an Android app on their way!) Questions? Call 413-250-8800 or email james@mainandme.com.